It is a beautiful day to eat some leftovers and throw down with strangers over discounted consumer items. Seeing as stocks stop trading at 1pm EST today, I am not expecting much from this low volume session for which many traders did not likely bother to show up. China name CTRP is gapping up hard on news of them acquiring Skyscanner Holdings. But that is not serving as a panacea for other high beta China names, as the likes of BABA SINA WB are flat or red here. 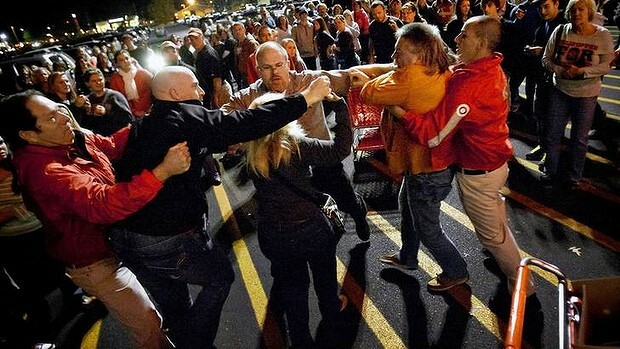 Regarding "Black Friday," the action in retail is expectedly slow. Best Buy is a name we looked at a while back as being a long-term bottoming play. And BBY continues to quietly improve on all timeframes, perhaps set to narrow the gap between it and its tormentor, AMZN, into year-end. 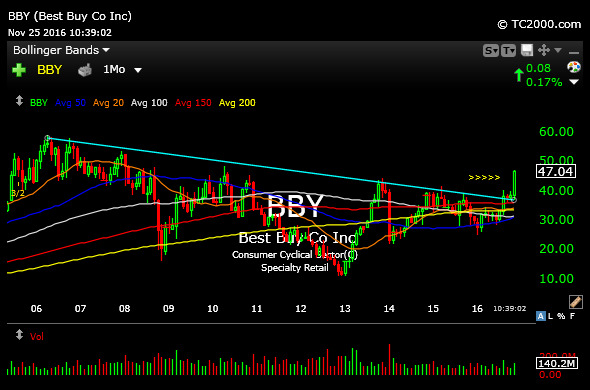 On the updated monthly chart, below, BBY is only now breaking out of a decade-long downtrend. And it is doing so to little fanfare, which I see as a bullish kicker. Going forward, as long as $45 and especially $42 hold into pullbacks, I am looking for a long entry here.